We then disconnect and remove the rotating drum from the inside of the machine. 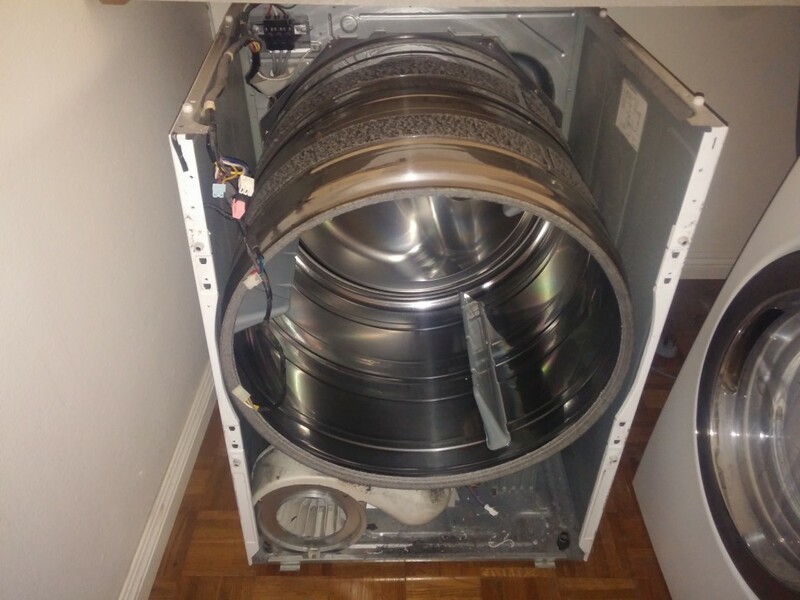 Once the dryer drum is removed we have access to remove the heating element from the very bottom of the dryer. Rotating drum removed to access heating element at bottom of dryer. In the next photo you can see the 5,400 watt faulty heating element connected to the machine. This must be removed and replaced with a working heating element. 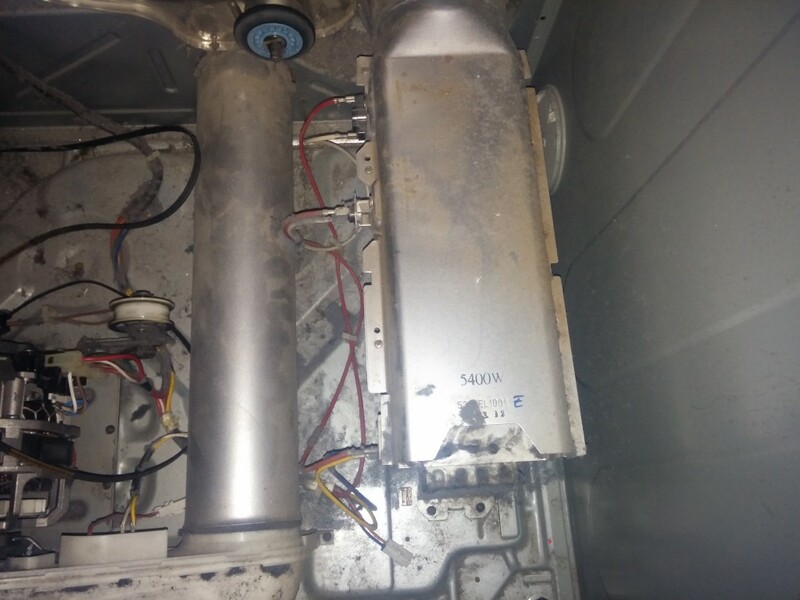 The heating element was removed from the machine and replaced with a new working heating element. The clothes dryer was then reassembled and tested for proper heat output. 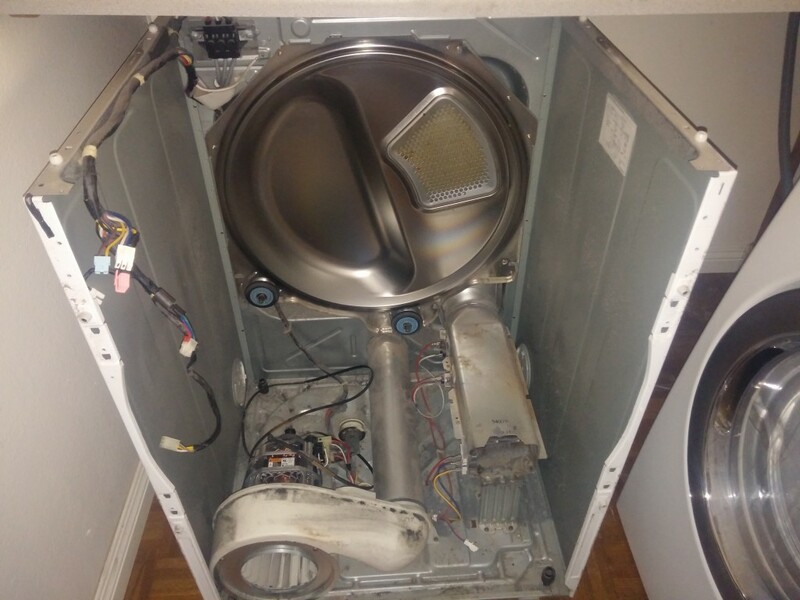 For more details on how and why a clothes dryer’s heating element can burn out take a look at SFGate’s article on “What Makes Heating Elements Go Out On Dryers?“. Repairs such as this should only be performed with the electricity and gas shut off and/or disconnected from the machine. 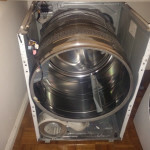 Leaving this repair task to the professionals is the best way insure a complete and safe appliance repair. 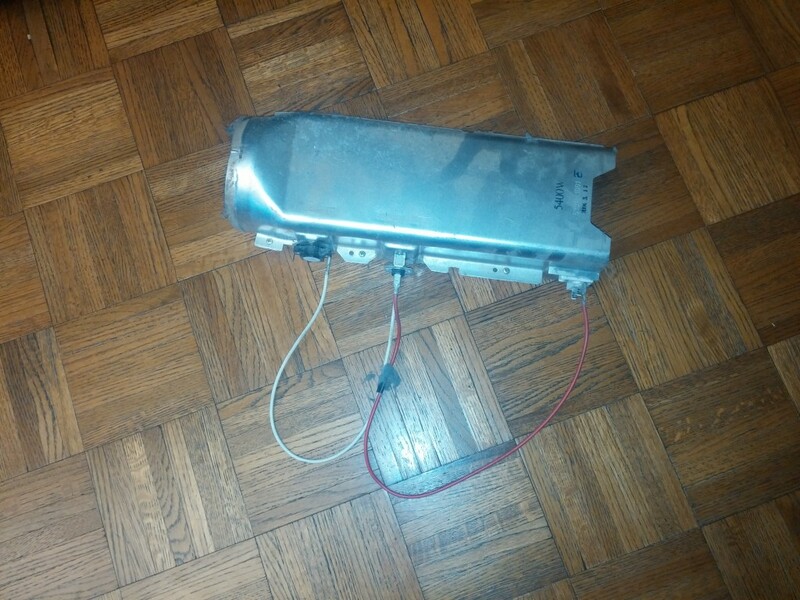 Here’s another photo of the heating element once we had removed it from the machine. The heating element had failed the Continuity Test. (Electricity cannot pass through it.) If electricity cannot pass through its coils, no heat can be generated by it. The faulty Heating Element after being removed from machine. Give us a call at 619-327-9501 to schedule an appointment for your appliance repair. We repair all appliances by all brand names, both residential and commercial. Our appliance repair services are available from Chula Vista to San Diego and nearly everywhere else in between. Please visit our service areas page for more information about our appliance repair service area.